The exotic dead animals that appeared in the menageries of Victorian Britain’s grand exhibitions were far from perfect specimens. Stuffed, stitched, painted hybrids – accuracy was not a priority. The Indian display from Dickinson's Comprehensive Pictures of the Great Exhibition of 1851, from the originals painted for Prince Albert, by Joseph Nash, Louis Haghe and David Roberts, 1854. 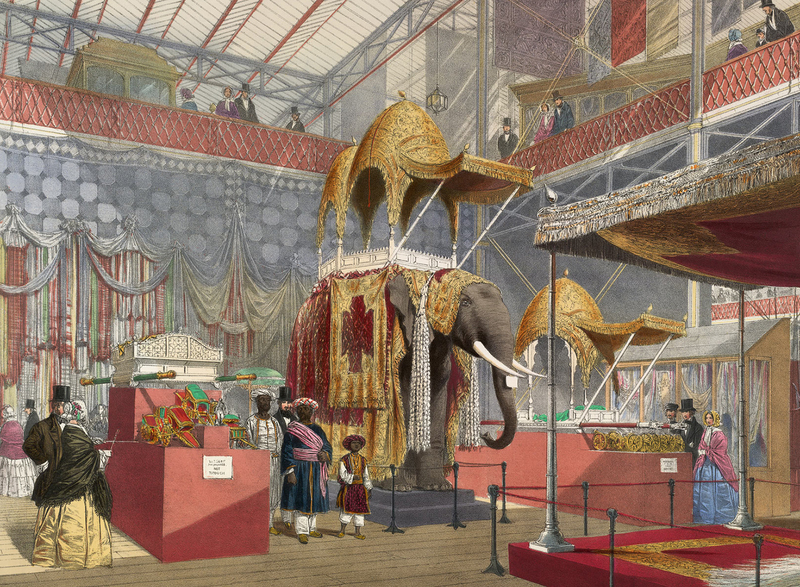 The organisers of the Indian displays at London’s Great Exhibition of 1851 had a problem: they urgently required a taxidermy elephant. They needed the elephant as a frame on which to display a lavish Indian howdah (an elaborate carriage used as a platform for transportation and game hunting by the Indian and British elites), which had recently been presented to Queen Victoria by the Nawab of Moorshedabad in the Indian state of West Bengal. Fortunately, an old female specimen was eventually found close to home at the Saffron Walden Museum. A large horse-drawn van brought her from Essex to Hyde Park. On arrival at the Crystal Palace, the howdah placed astride her back, the elephant loomed large within the Indian displays. Unlike the howdah, the elephant did not come from India at all. The Saffron Walden Museum had bought her skin from a contact in South Africa in the 1830s and she had been on display in the museum for two decades. She was also, as an African elephant, the wrong species. One of the key signifiers of elephant species is the ears; hers were extended and curved and unlike female Asian elephants, she also had lengthy arched tusks. Her back would have been longer, too, and not quite the right shape to securely house a howdah. Nevertheless, the display went ahead. Nobody seemed to mind that this African skin was found in Essex and exhibited in London as an Indian animal. The Great Exhibition’s elephant is revealing of the shortcuts that were sometimes taken in the selection, curation and display of taxidermy creatures in Victorian exhibitions. Taken together, the howdah and elephant represented the cultural and natural wealth of colonial India. But there is an odd contrast between them. The howdah was richly decorated and (in a ghoulish twist) adorned with carved elephant ivory. It was also owned by Queen Victoria and authentically Indian in origin. On the other hand, any taxidermy elephant would do as a stand for this opulent seat. Exhibitions were unusual spaces in which the natural world and manmade objects came together in numerous, sometimes contradictory, ways. As in the case of this species-shifting elephant, where taxidermy was concerned, perfection was not a requirement. 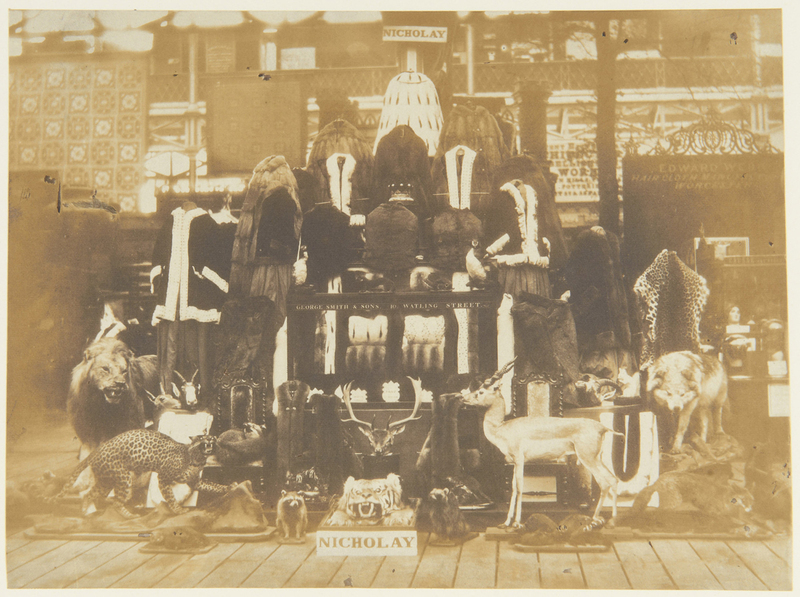 Photograph showing a collection of furs and taxidermy assembled by Nicholay and Son, London and exhibited at the Great Exhibition. Claude-Marie Ferrier, 1851. For the Great Exhibition, a motley assortment of creatures was transported across land and sea. It sparked an exhibition craze and promoted a global trade network, supplying a diverse array of events with multifarious items for display. Animals arrived in Britain in various states: dead and alive, whole and incomplete. Whole animals and skins could be deposited in large barrels of pickle, ready to be mounted and remade into animal shapes by taxidermy firms in London and other British cities. Alternatively, skins could be covered in alum salt, or a healthy coating of arsenic soap in the case of birds, to dry them out and prevent rotting on long voyages. These skins were folded, hair side down and coated in turpentine to prevent insects from feeding on them en route. Many creatures, such as the Great Exhibition elephant, were also borrowed and loaned from existing museums and private collections to create the temporary menageries. The famous Piccadilly taxidermist Rowland Ward used his connections in India to acquire skins for the Colonial and Indian Exhibition, held in South Kensington in 1886. One of them was the Maharajah of Cooch Behar, who shipped various skins to London from his palace in West Bengal. The maharajah had shot many of these animals locally in the tropical forest. In his memoir, Ward emphasised these animals’ authentic provenance. He placed value on the skin belonging to an animal that had recently been shot in its country of origin, as if an element of its environment travelled with the creature to Britain. Living animals were also displayed and visitors were encouraged to interact with them. The Empire of India Exhibition, held at Earls Court in 1895, provided domesticated camels for visitors to ride. The exhibition catalogue described how the Indian displays could be viewed ‘from the superior elevation of a camel saddle’. But it wasn’t all about the exotic and the distant. At the International Health Exhibition, held in London in 1884, domesticated and meat-producing British animals were displayed. Live cows and taxidermy Whistley four horned sheep were placed side by side, in a diorama of a British farmyard. In the early 19th century, when the Great Exhibition elephant was created, taxidermy involved the literal stuffing of animal skins. In the case of large animals, a metal cage would be packed with wads of organic material, such as hay or cotton. The skin would be draped over the frame and sewn together. By the time the elephant was displayed at the Great Exhibition, new techniques were fast developing. Taxidermists competed to trial and showcase the freshest methods, which could be compared and critiqued by the visitors who saw their displays. These new developments often involved creating a mannequin, or animal body shape, to mould the skin around. 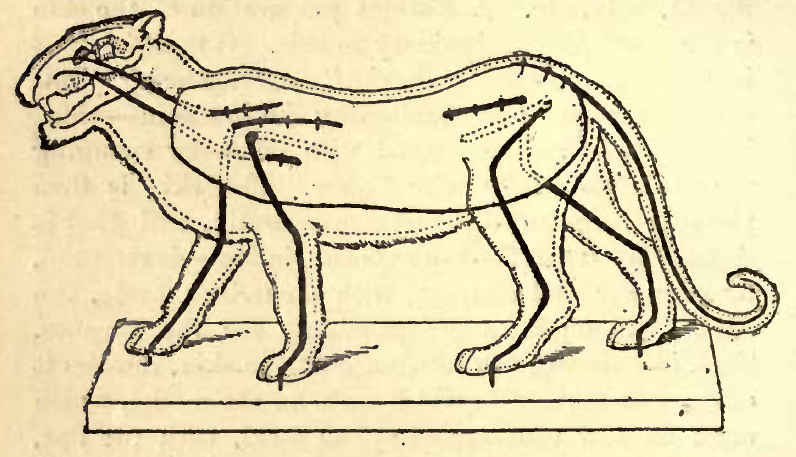 To complete the taxidermy mount, the legs were often wired and positioned, mucus membranes were painted to give the appearance of moistness and glass eyes were squeezed beneath eyelids. The Great Exhibition was a decisive moment, when specimens came to be judged on their ‘lifelike’ manner. The Morning Chronicle, a London daily, described how the taxidermist Francois Comba of the University of Turin had successfully transplanted a slice of Sardinia’s natural environment into the heart of London. The paper reported that his ‘magnificent’ taxidermy European Elk was ‘all but breathing’ and looked as if he were ‘petrified in his own skin’. The secret of Comba’s success was to mould his animal frames in clay, before casting them in papier-mâché and covering this casting in the original skin. Not all all experimentations with animal bodies were received so favourably. Dr Beevor of Newark on Trent trialled a method of covering animal carcasses in a tropical tree sap and placing the skin on top. The problem, The Morning Chronicle reported, was that this led to the skin being placed on a ‘rough and defective’ frame. This technique did not catch on. Exhibitions were arenas for trial and error, where aging stuffed elephants jostled with new-fangled elk specimens. Visitors came to these exhibitions from across Britain and further afield. On arrival, they travelled between the astonishing variety of national displays, as if journeying between exotic overseas destinations. 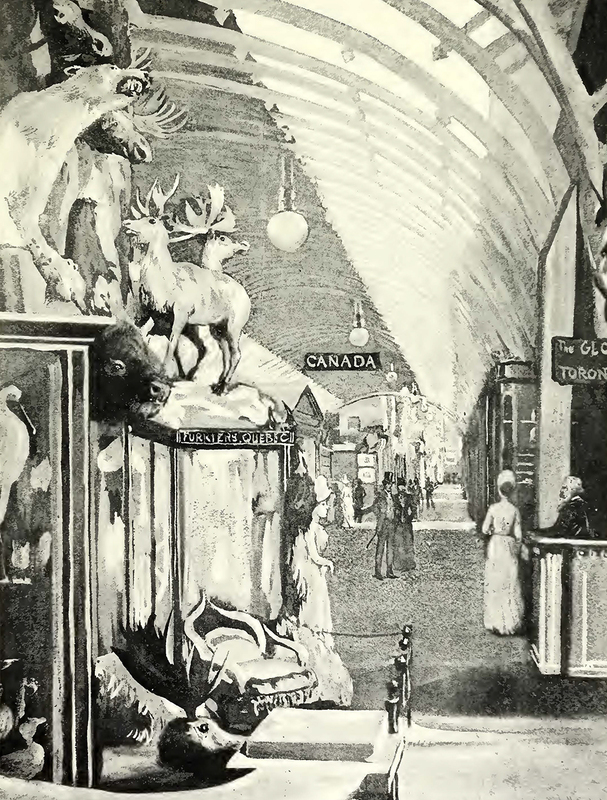 For the 1886 Colonial and Indian Exhibition, Canada displayed a colourful array of taxidermy creatures in London. The Canadian representatives produced a vertical display of taxidermy specimens, each placed on an octagonal frame. Each animal within the pile represented a different Canadian region. The polar bear, peering down from the top of the frame, signified the frozen far north, an image literally reflected in its snow-white fur. This produced a dramatic vision of Canada’s diverse wildlife and environments. Canada was just one of many countries and ex-colonies producing patriotic displays through the medium of taxidermy animal bodies. But whereas Canada displayed a carefully choreographed vision of a newly independent country, the Indian displays were still controlled by British vision. Taxidermy creatures were physical symbols of the power of the British over colonised lands – and colonised wildlife. 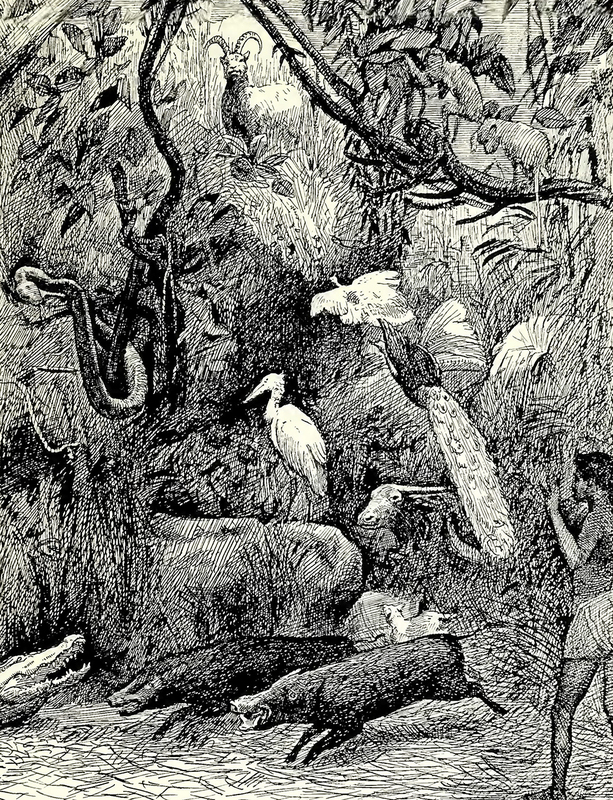 Rowland Ward commented that the aim of his ‘jungle’ display at the Colonial and Indian Exhibition was ‘to illustrate some of the more striking representatives of the flora and fauna of India as a whole.’ This was an ambitious attempt to squeeze an entire country – with geographies ranging from tropical Keralan backwaters to the soaring Himalayas – into one display. Ward recycled much of his display for the Empire of India Exhibition in 1895. In both displays, he used numerous taxidermy animals which would rarely, if ever, be found in the same ecosystem. As the catalogue reported ‘several thousands of specimens are to be seen, including elephants, rhinoceroses, tigers, leopards, buffaloes, bison, wild sheep, ibex, antelopes, gazelles, snakes, crocodiles, and a vast number of birds, butterflies and insects’. That this density of animals would ever be found in such close proximity in the wild is highly unlikely; this was an animal spectacle created for the British public. It included all of the charismatic Indian animals in one accessible place. Surrounding Ward’s ‘jungle’ at the Empire of India Exhibition was a replica Indian city, incorporating buildings from numerous regions and cities, spliced together to create a single urban centre. India was reduced to a singular vision. In fashioning his ‘jungle’ at the Colonial and Indian Exhibition, Ward had a ‘free telegraph pass’ to wire ‘for anything’ from around the globe. Unfortunately, he did not receive a number of the specimens he had requested from India, a reminder of the time delays and physical difficulties faced when sending and receiving animals and objects by sea. Without all of the Indian skins he needed, Ward improvised by manufacturing animal bits and producing a motley assortment of artificial hybrids. As well as fixing artificial skins (made from fabric he found in his Piccadilly studio) onto specimens, he described mounting ‘several real heads’ on ‘imitation bodies’ which he then ‘coloured’ adding that ‘no one found it out’. A shipment of Indian grasses and palms also failed to arrive. Undeterred, the ever-resourceful Ward headed off to rural Norfolk to collect reeds, rushes and dead trees for the display ‘to take the place of the Indian foliage’. Armfuls of local British and Indian vegetation (some of which had arrived on an earlier ship) were placed on the diorama along with ‘imitation rock work’, likely made from paper coated in a thick layer of glue. These were deployed, Ward recalled in his memoir, for ‘concealing any portion of an animal I did not desire to expose’. Ward hid his taxidermy forgeries with East Anglian vegetation. This distortion of taxidermy creatures and environments occurred partly due to the exhibitions’ rushed nature. At the Great Exhibition, the old African elephant was all that the organisers could find in time. The preparation for these displays was hurried, the exhibitions only fleeting. Taxidermy animals did not have to stand the test of time as they would have in a museum. Like the streams of people who came to London to view them, the taxidermy creatures also soon moved on. 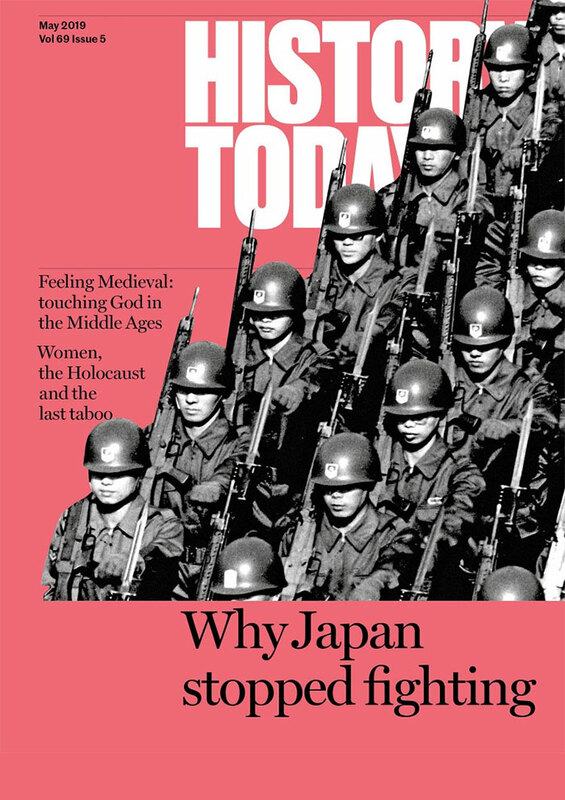 They too were only visitors. The Great Exhibition elephant was returned to Essex, where she remained on display until the mid-20th century. Ward described how many of the ‘jungle’ creatures ‘which are lent by the Rajah, are going back to India to be fitted up in his palace’. The exhibition spaces themselves were also only temporary. These structures lasted a short while before, like the objects and animals they housed, they were disbanded – the Crystal Palace was the first large scale prefabricated iron and glass building. Temporary, fleeting and imperfect, these creatures brought a short-lived and curious piece of the wild to Victorian London. Alice Would is completing a PhD on the Victorian taxidermy trade at the University of Bristol and University of Exeter.